If you’ve ever had an abscessed tooth, you know that waiting until Monday at 9 am isn’t an option. An abscess can strike with little to no warning, and the pain can start as a mild heat and cold sensitivity and develop into severe pain within hours. Physicians realized long ago that Monday through Friday from 9 am to 5 pm wasn’t the only time patients needed medical attention. Emergency rooms exist when you have a new pain, when your doctor’s office is closed, but there are no emergency dentist offices. At McCarl Dental Group, we’ve decided to change that. Our emergency dental care is available when you need us. No matter what your dental emergency, call McCarl Dental Group. Infection in the root of a tooth or between the gums and teeth can cause an abscess or painful toothache that is caused by spreading infection. This can happen if a tooth is decayed, broken, or if a patient has severe gingivitis (periodontal/gum disease) which allows bacteria to enter the soft center of the tooth or pulp, and cause severe pain. If a tooth is abscessed, infection continues to spread, and surrounding gum tissue and supporting bone structure can become infected. Abscessed teeth can cause a toothache, swelling, pus around the tooth or gum, fever, muscle aches, swollen glands, and general nausea or queasiness. Occasionally, a minor toothache especially when chewing and sensitivity to heat or cold is the main symptom of an abscessed tooth. Sometimes, patients do not recognize these symptoms are related to their teeth. The more severe and abscess becomes the harder it is to ignore. Patients who experience swelling of the gums or jaw, bitter taste in the mouth, bad breath, or draining sores on the gums are much more likely to realize they have an abscess tooth. However, once the infection reaches this point, it is more difficult to treat. If you have recently had tooth decay (cavities), trauma to your tooth (even if you didn’t believe damage was done), or gum disease, don’t hesitate to contact us, if you experience any of these symptoms. It is important to contact your dentist as soon as you have dental pain. When you seek treatment for an abscessed tooth, there are a number of things we can do to help you feel better quickly. The first priority for dental treatment for an abscessed tooth is to drain the abscess or pus surrounding the tooth. We will likely prescribe antibiotics to help your body fight the infection, and prevent any further infection. Sometimes the patient will need to start antibiotics before the dentist drains the abscess. Once you contact our on-call dentist, we will work with you to develop a treatment plan. During the treatment planning process, our dentists take digital x-rays and intra-oral photographs and project them on a large television monitor so our patients can see the damaged tooth very clearly. Our goal is to preserve the tooth whenever possible. An x-ray will help us determine the extent of the infection. If the abscess appears to be only in the gums, it is possible a minor incision may be enough. 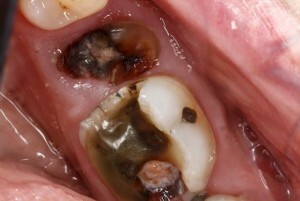 However, most abscesses are much deeper, in the pulp of the tooth. Root canal therapy to extract the infected pulp, may be the next step. If a root canal is the best treatment option, our team will remove the infected pulp from your tooth. The tooth is filled with gutta-percha (a gum-like substance), and sealed. The tooth may then need to be restored or strengthened with a crown. In some cases, the tooth may need to be extracted. This is a mutual decision between the patient and dentist. When an extraction is necessary, a dental implant restored with a crown feels and functions like a normal healthy tooth. If you have severe tooth pain, nausea, or fever you believe are related to an abscessed tooth, don’t wait until Monday to get help. Call McCarl Dental Group’s on-call dentist. McCarl Dental Group offers same day emergency care during regular business hours as well as evenings and weekends. If you’re in need of a dentist for any of your oral health care needs, schedule an appointment today. Our knowledgeable staff is available at either of our two convenient locations Millersville or Greenbelt, MD.